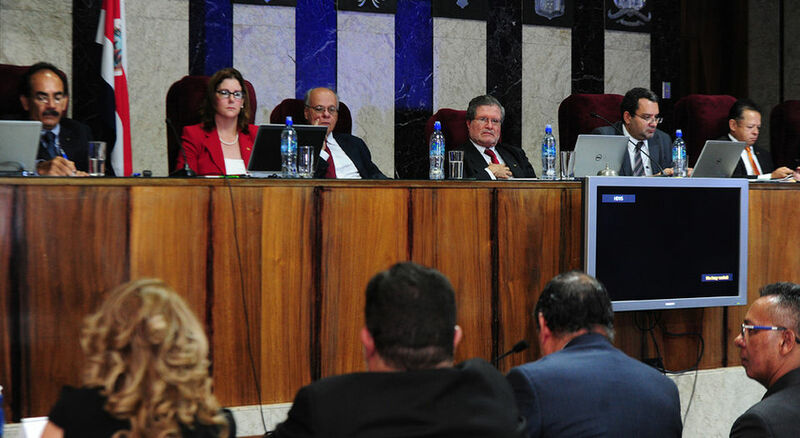 The magistrates of the Constitutional Court (from left), José Paulino Hernández (from left), Nancy Hernandez, Fernando Castillo and Fernando Cruz. File photo. (QCOSTARICA) The Banco de Costa Rica (BCR) does not want the public to know the salaries of its officials and the Constitutional Court supports the action. In a decision on Thursday, the magistrates of the Court said it “valid” the decision by the bank to place a password to an electronic file with public data. The action before the Court was brought by two journalists from the weekly El Financierio (a La Nacion publication), when the BCR prevented access to the electronic data. For legal expert, Juan Manuel Casanueva, the told La Nacion the Court ruling “holds no water”, since the the institution supplying the information always will have control of the original files. “It is a clear form of censorship,” says Alejandro Fernández, one of the journalists filing the Court action. The Court ruling is also a contradiction to the position taken by the Central Government on the access of information, which is one of the principles of the Global Alliance for Open Government, which the country forms part of. “Any government that adopts or talk about open government must be consistent with policies of open data in formats that can be used and processed by machines,” said Casanueva. In this regard, Communications Minister Mauricio Herrera said the government will respect Court decision and that the Executive will continue to promote the publication of information in free formats, as part of its accountability commitment.